If Second-Half-Vs.-Purdue Kyle Guy shows up for the Final Four, Virginia is almost definitely winning the 2019 national title. The Wahoos' memorable Elite Eight win vs. the Boilermakers on Saturday had so many factors that made it a classic: Carsen Edwards' 42-point performance; Kihei Clark's wherewithal to pass to Mamadi Diakite in the chaotic final seconds of regulation; Diakite hitting the game-tying shot; 23 made 3-pointers; trading haymakers; so on and so forth. It also had Virginia's most important player, Guy, returning to form. And he did so after hurting his right ankle late in the first half. "I stepped on someone's foot, I don't know, and I heard it pop," Guy said. "That's kind of mostly why I was, you know, rolling around like I was, because I was really scared." It was at about this moment when Virginia fans felt the nerves really kick in. Until that moment, Guy's NCAA Tournament career was a bust. He was 4 for 25 from 3-point range through 6.5 games. At halftime of the Purdue game, having scored five points, Guy was on pace to average nine points in his NCAA tourney career. This from a player who has come to average 42.6 percent from 3-point range in his career, has an effective field goal percentage of 55.0 and, this season, is scoring 15.2 points per game. While Diakite's delicate tip-out, Clark's heady send-back and the buzzer-beater are the anecdotal reasons Virginia won -- getting the game to overtime first -- Guy's game-high 25 points were the biggest factor in Virginia keeping pace with Purdue. Guy had 20 points after the half, finishing with five 3-pointers and winding up with a career-high 10 rebounds. It was also the first double-double of his career. "I don't really believe in slumps and I always found rhythm when my guys are trying to find me," Guy said Saturday. "The two at the end did a great job screening and obviously Ty (Jerome), Kihei, Dre (De'Andre Hunter), they all were looking for me even though I struggled in the past few games. All the credit goes to them." 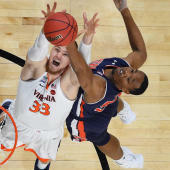 Virginia took its first lead of the Purdue game thanks to Guy, who sent a jolt into the team when a 3-point attempt swished in 26 seconds into the second half. It wouldn't surrender that lead until late into the game, when things got appropriately epic. Virginia's defeated nine ranked opponents this season, a school record, and all the way it's been Guy who's had the swagger and confidence to get the team to this point. Jerome and Hunter are basically right there with him -- Jerome's a killer and Hunter's the best two-way player on the team -- but Guy has been most vocal about owning the UMBC loss, reveling in the haters and not running from the embarrassment of 2018. "I personally love getting heckled and booed," Guy told me in February after Virginia won 69-61 at North Carolina. "That doesn't faze me. Maybe one day they'll figure out." He seems to have figured out a lot as well. I was there, courtside, for the Virginia wins in Louisville. Guy looked as loose as anyone on the floor, Edwards included. On multiple occasions, after grabbing offensive rebounds or sinking 3-pointers, he was grinning like a young boy while running back up the floor. The spell's been broken. Cavs coach Tony Bennett acknowledged to me before the Purdue game that Guy getting right was probably going to be essential to Virginia moving on to the school's first Final Four since 1984. "You've got to give Kyle freedom, because he's a moment away from getting it rolling," Bennett said. "But he has stepped up his game defensively. He's competing at a high level. He's so keyed upon, but he's passing and making some plays. The rest of his game has been strong and it's always noticeable for a guy, a shooter of his reputation when it's not going." The Cavs rank second at KenPom in offensive efficiency and are eighth in 3-point accuracy (39.4 percent). Guy, who's scoring nearly 1.2 points per possession this season, is pivotal to Virginia's championship endgame. Through three and a half games, he was a hindrance. Then a twisted ankle, somehow, got Guy in a good place. And now Virginia, long labeled as the No. 1 team in multiple advanced metrics, looks ready for its best game yet. And it'll be on the Final Four stage. "We got a lot of cold-blooded dudes on this team," Guy told me back in February. When he's going hot, Guy's the coldest among them. If the Guy we saw in Louisville makes his way to Minneapolis, it's a wrap. Virginia's winning the title.